The baloth's enormous body convulsed one last time in Kalyntri's jaws, its widened eyes giving way from the rage and fear that had marked its last moments to the stumbling resignations of breath and care. As the beast's eyes dimmed, Kalyntri crunched his jaws through the baloth's torso, thick bony armored plates snapping like sticks as beautiful blood and meat began their hurried passage down the dragon's throat. Kalyntri paused from eating to roar his triumph to the sky and sea. He wanted Talrand to hear it, wherever the damnable merfolk might be. Talrand's proclamations had been very clear that all of the Kapsho was now Talrand's kingdom and all of its denizens under Talrand's control. Kalyntri's predations were at an end, claimed Talrand, and the dragon would have to kneel in fealty, leave the Kapsho seas, or die. His kingdom? Kalyntri would taste the marrow of Talrand's bones! The dragon looked at the other baloths still backed in a large circle. They were ferocious predators, used to dominance, yet they knew better than to challenge Kalyntri. The law of superiority was a natural one, followed by those in Kalyntri's domain for hundreds of years. Followed by most, anyway. The baloths ambled out of the clearing, retreating to the jungles of their island home. Kalyntri swung what was left of the carcass up through the air and opened his mouth wide to catch it on the way down, swallowing it whole. His belly finally full, he rose into the air, ready once more to survey his dominion. A fine dominion it was, too. Kalyntri had been the natural ruler of this part of the Kapsho seas for over three hundred years. Flanked by large islands to the north and south, between thousands of squares miles of ocean and archipelagos, the dominion formed perfect hunting grounds for the voracious dragon. Occasional human settlements would form on the islands, but when they got too big, Kalyntri would destroy them. The merfolk, too, had taken offense a few times at Kalyntri's ocean hunting, but they went just as smoothly down the dragon's gullet as the other food from the sea. Talrand was the first note of discordance in what had otherwise been a harmonious melody of power and food for all these years. Talrand had first appeared a year ago at one of the many island caves Kalyntri used for lairs. Although a merfolk, he seemed equally comfortable on the ground as in the seas. Even more unusual was the obvious magical energy that radiated from him. A mage, and a very strong one at that. Most unusual, and most offensive to Kalyntri, were his drake servants that sat on each shoulder. Kalyntri had listened to the merfolk blather for a few seconds before responding with a coruscating blast of flame that filled the cavern. He had not expected the mage to die so easily, and there was no charred pile of bones and ash lying in wait to suggest that this was a matter quickly solved. Talrand was merely gone, and only the problem of him, and his drakes, remained. 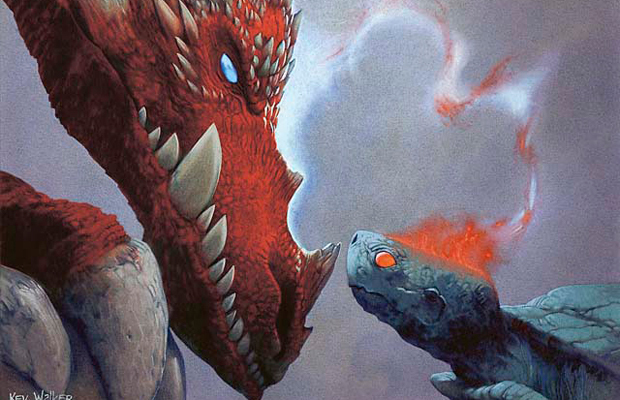 Dragons and drakes, the "little dragons," had always had a contentious relationship. 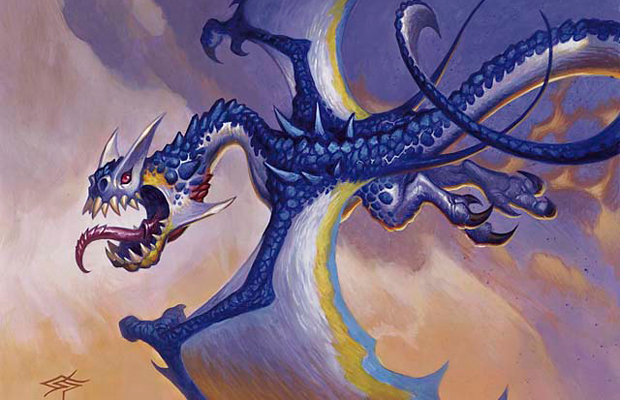 The drakes feared their larger cousins and the dragons' obvious superiority. But what they lacked in power they made up in numbers. To themselves and the outside world they were known as drakes, and they were everywhere. Conniving scavengers, they hunted in packs, using their sheer numbers to bring down prey they had no right to. But worst to Kalyntri were those drakes who had given up all pretense of freedom, such as those who now served the upstart Talrand. How had Talrand convinced the drakes to serve? Certainly the little ones, ever jealous of power, were always willing to serve those who had it; Kalyntri himself had a few for minions over the years. But the efforts and reach of Talrand suggested an amount of support that was surprising to the dragon. Well, no matter how powerful the mage was, Talrand's reign would come to a bloody end once his head was ripped from his shoulders and eaten as a delicious snack. Now all Kalyntri had to do was find him. The dragon was soaring high over the Kapsho seas. His wings fully unfurled, the sun glinting off the red metallic scales of his head and back, Kalyntri knew he was an awe-inspiring sight. A red comet among the azure seas and skies. None dared confront him. None had dared for such a long time. Perhaps it was good for the occasional dumb and arrogant contender to have pretensions. It had perhaps been too long since Kalyntri had had an opportunity to fully show his power. Lost in this thought, Kalyntri almost missed the lone dark storm cloud up ahead. A single small cloud of blackness amid an otherwise endless blue sky. The air had the tangy scent of a fresh storm, recently passed. As Kalyntri flew lower, he could see a small ring of islands dotting the water beneath cloud. And there, in the middle of the islands, in the water, was a man. No, he was on the water. And not a man, but a merfolk. Good gods, was Talrand suicidal? Or perhaps simply that dumb and delusional. Kalyntri never had understood how the lesser races thought. He swooped low, eagerly, not wanting to lose Talrand again like he did the first time they met. But this time Talrand had chosen the wide open seas. No place to run, no place to hide. And if Talrand thought he could swim away... Kalyntri had made many a tasty snack of creatures who thought the deeper oceans were sufficient refuge. Talrand stood on the water, small bubbles constantly churning in the sea underneath his feet to keep him aloft. There were no drakes around, not that a few of them would have made any difference. 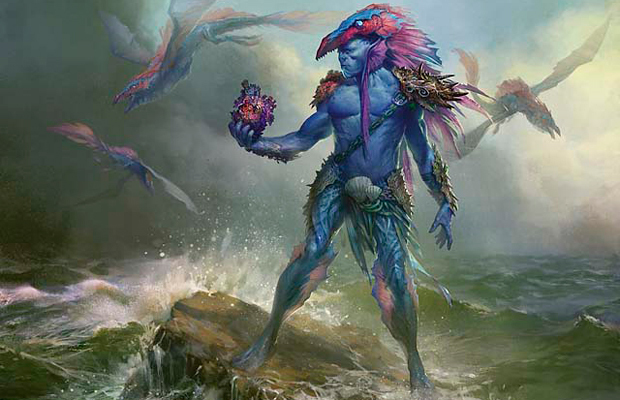 Kalyntri had seen many merfolk during his long reign, and there was nothing physically remarkable about Talrand—no clear sign that this was a being with pretensions to grandeur. He was just a small meat puppet on two legs, like the thousands of other meat puppets the dragon had eaten or burnt over the years. Except most meat puppets did not have the magical power Talrand seemed to have. But even powerful magics were no match for an enraged dragon. The fool was holding up a hand. Kalyntri was amused. He wanted to hear the last words of this meat puppet. The dragon hovered a short distance away from the blue-skinned mage, his nostrils deliberately letting loose puffs of smoke. Feel the growing heat, feel your impending death. Kalyntri had not yet decided whether to eat or incinerate Talrand. Both would be immensely satisfying. 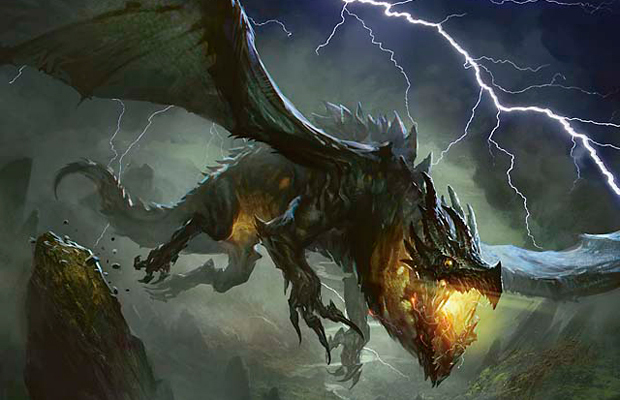 Talrand looked up at the dragon, and his face betrayed no fear, no hint of the seared destiny that soon awaited. Kalyntri was amazed at the mage's power of self-delusion. "I didn't want to have to kill you. I would much rather have found a way to productively use you. Your strength and predictability are both major assets. I have explored many paths of keeping you alive. I regret none were viable." As Talrand spoke, his voice was calm and rational. A strong voice, one obviously used to leadership. But the voice of a crazy man. And soon to be a dead one. Kalyntri's rage built with every hot breath through his nostrils. "In fact, as I examined you and your environment more closely, I became almost envious. You were built to prey upon those weaker than you. It is a simple life, and one that you were very good at. Unfortunately, I was built to perform more complex activities. Learning. Analysis. Understanding. And once I understand how something works—a spell, a system, a culture, the world—I must make it work better. How can I not? Yes, sometimes I wish I were just a predator." Kalyntri roared, an incandescent rush of rage that transmuted into scalding flame, a bright flash that boiled away all water and air it touched. He will burn! Yet Talrand had already been moving, running sideways on the water, and fog started rolling in from all directions. Kalyntri noticed an odd magical "echo" as Talrand had summoned the fog, but he paid it no mind as he bulled ahead, chasing Talrand's dimming figure. Huge geysers of water erupted from the sea's surface and formed nooses that lashed around the dragon's wings, seeking to hold him in place. Another strange echo resonated in the dragon's mind. Kalyntri burst free from his watery bonds and lifted up to clear the low-lying fog. Higher in the air, he could make out a dim humanoid figure shrouded in fog below and rushed down to attack. Talrand looked up to see the charging dragon, and winds and waves surged to meet him. It barely slowed the dragon down as he let loose a bright gout of flame aimed at Talrand's head. At this short distance the mage had no room to maneuver and an upsurge of water met and barely deflected the oncoming flame. 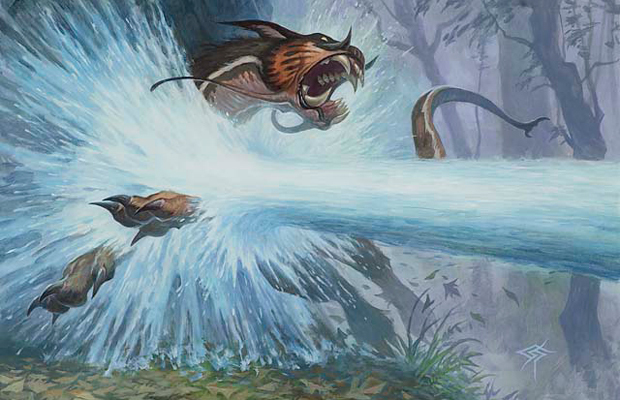 Kalyntri slowed and sent his large tail whipping around the side of the water column, faster than thought, crashing into Talrand with a sharp crack that sent the mage flying through the water. The dragon turned to chase and saw as the water leapt up in countless small places to cushion Talrand's blows and slow his deadly velocity. Another echo. I will eat his head! The dragon rushed fully into Talrand, and only a weakly summoned wall of water prevented the dragon from crushing Talrand outright. The impact of the blow sent Talrand sprawling across the water once more before skipping onto the beach of one of the nearby islands. Talrand sprawled on his back, bloody and struggling to get up. Kalyntri approached and smiled, having savored the thought of this day for the last year. This is the consequence of fighting against power. The dragon beat his large wings slowly, hovering over the prone and beaten figure, and prepared to descend and feast. Talrand lifted his head and spoke, his voice still sounding strangely strong and confident. "I have a gift for you, dragon. I bring you—" and here he paused and looked up, a shadow passing over his face as something came between the sun and his body—"rain." Another echo. Kalyntri swung his long neck around to look up at the sky. He saw the storm cloud that originally marked Talrand's location and very large drops of rain were now falling from it. He turned back to dispose of this uselessly talking merfolk, when something tore through the outer membrane of his left wing. Kalyntri screamed in pain. He looked up and realized they were not large drops of rain falling from the sky. Drakes. The echoes. They were hurtling from the cloud above, dozens of them, too many to count. All aimed at Kalyntri. Another drake bit at his ear and flew off as the dragon tried to snap it in his jaws. Kalyntri let loose a blast of flame but it veered wildly as the drakes scampered out of its path. 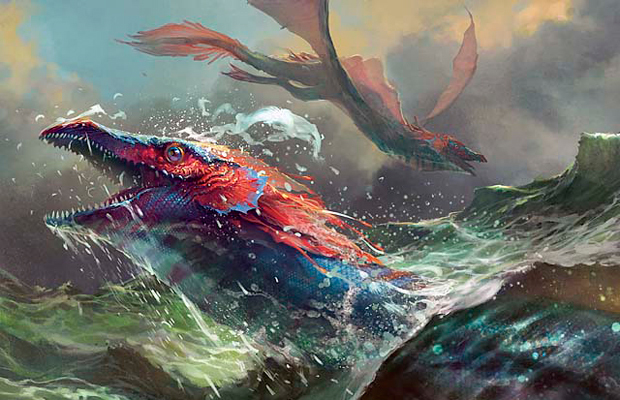 The drakes were darting in and out, seeking spots to claw and bite Kalyntri. Most of the dragon was protected by thick scales, but not all. Soon the air became so thick with drakes that Kalyntri could not help but rend or crunch a few without special care. But for every one or two he killed, ten more were drawing blood from the great dragon. It suddenly occurred to Kalyntri that he was losing. His eyes widening with fear, he sought to rise, to flee. The small ones cannot outrace me in the sky. A large geyser of water crashed into his body from the sea and sent him sprawling onto the beach. He struggled to get up, but was failing. I've lost so much blood. And still the drakes were swarming, pecking, biting, chewing. He tried to summon more flame, but the flame was spent. And there was Talrand, standing to one side, still bloody and bruised, but looking calm, confident. Kalyntri desperately wanted to eat his bones. The dragon's body continued to thrash, though with softer movements each time. The dragon saw a large drake fly in from the deeper ocean and to Talrand's side. Talrand scratched under the chin of the drake, who made small, throaty purring sounds. Then the drake looked at the dragon, and its hunger there was unmistakable. A hunger the dragon himself possessed, not too long ago. Or was it an eternity? The drake looked back at Talrand, and Talrand nodded. "As I promised. Service to me means an end to the tyranny of dragons. He is yours." The drake scampered over to the dragon. He looked into Kalyntri's wide eyes, so recently marked by rage and fear, though now giving way to the realizations of physical necessity, those stumbling resignations of breath and care. The drake disappeared from Kalyntri's sight, and next the dragon felt sharp jaws at his unprotected neck, and he felt them crunch. The dragon's eyes dimmed.